This French poster artist proved to be a jack of all trades in the printing and publishing world, as well as a great talent. He worked as the art director for two separate magazines– Le Matin (1911 to 1914) and Le Rire (1932). In 1917 de Valerio went to work for the music publisher, Salabert where he spent seven years. Here at Salabert, he designed over two thousand different sheet music covers. After designing covers, he worked as an adviser for the printer Devambez (1926), and from 1936 he served as associate director of advertising for the publisher Perceval. However, even with his busy and productive career, de Valerio still found time to produce many posters, all of which were executed with a stylish Art Deco flair. In this poster for major French car manufacturer, Citroën, the artist exemplifies a simple goal: display the car. 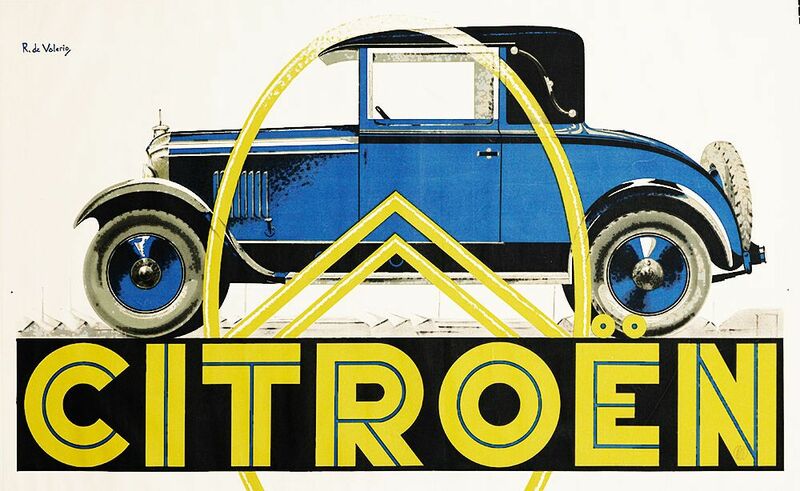 De Valerio accomplishes this task in a detailed profile with thrilling typography set in exciting, bright, complimentary colors yellow and blue– an Object Poster in the French style.